I had a fantastic holiday and I hope you all did as well. In terms of presents (let's not kid ourselves, holiday spirit is lovely but presents are a large part of the holiday joy and anticipation), I had a phenomenal season. 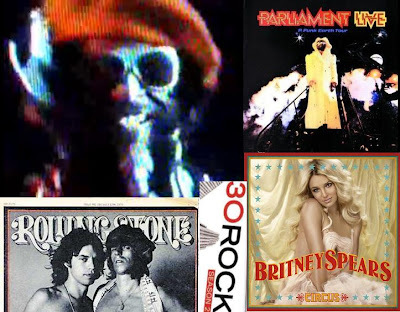 I got two P-Funk bootlegs (Houston 1978 and Landover 1981), a few Parliament albums (Live: P-Funk Earth Tour and Chocolate City), an album of Funkadelic rareities (Toys), a Marvin Gaye album (Midnight Love), the new Britney Spears and Lil Wayne CDs. My parents and I both got each other the second season of 30 Rock on DVD. Nicola gave me the beautiful fox fur coat I mentioned a few posts earlier, and a vintage Rolling Stone from 1975 with Mick and Keith on the cover. However, the most important gift I received...well, it's hard to explain. 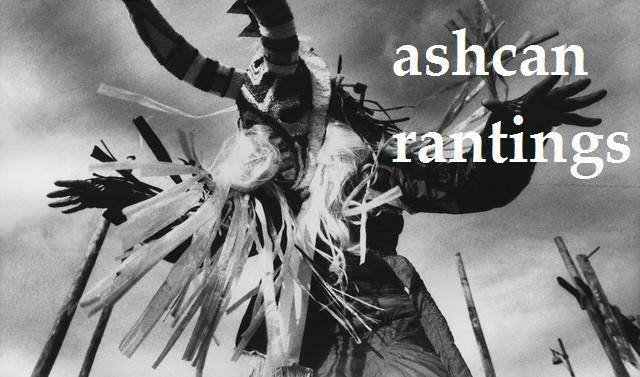 Since I became a P-Funk fan, I have hunted this one album - I've humiliated myself in my attempts to own it for myself. It's unspeakably rare and valuable, but a very incredible and generous friend bought it for me. 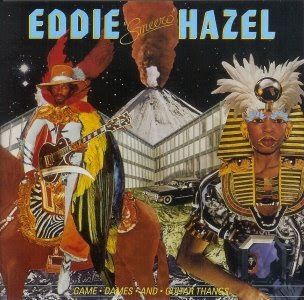 Among P-Funk fanatics and guitar connoisseurs in general, Eddie Hazel is a legend. His psychedelic yet soulful style, best typified by 1971's "Maggot Brain," led many to believe he would carry on the legacy of Jimi Hendrix, who died shortly after Hazel rose to prominence with Funkadelic. And while Hazel was a central figure with early Funkadelic, particularly on Standing On The Verge Of Getting It On, where he wrote every song, a number of problems that can be traced to drug addiction ultimately caused his role to diminish as the group became more popular throughout the Seventies. He continued to make infrequent appearances with the group until his death in 1992, but remained best known for his work from 1970 - 1975. Which is where Game, Dames And Guitar Thangs comes in. Issued by Warner Brothers in 1977, it was the only album released under Hazel's name during his lifetime and considered one of the holy grails of funk due to its rarity. After nearly 30 years of having to rely on bootlegs, poor-quality tapes or wishful dreams, Hazel's solo album is finally available on disc for all to enjoy. Game offers none of the thematic storylines or compelling characters of other P-Funk releases. Its intention is to simply spotlight Eddie's skills, making this perhaps the most purely "musical" album in the P-Funk canon. The record's centerpieces are two of the unlikeliest covers you will hear: "California Dreaming" and "I Want You (She's So Heavy)." With able assistance from a cast that includes Bootsy Collins, the Brides of Funkenstein, Jerome Brailey, and Bernie Worrell, Hazel just goes off and takes these numbers to another plane, especially on "I Want You," which is transformed into an apex of funk ecstasy. In short, if you consider yourself a deep P-Funk fan, you have to own this album. This record means the world to me. I feel validated as a P-Funk fan just for owning it and, oh yeah, it's a straight-up phenomenal record. I can't stop listening to it, and whenever I look at it and remember I own it, a feeling of warmth and joy washes over me. The only problem is that now I have nothing else in life to strive for - my main plan had been to get rich so I could afford this album. But now I have no need for money. New life plan: sit at home and listen to "Game Dames and Guitar Thangs" all day. I hope everyone elses' Christmases were half as satisfying as mine! Posted by molly at 12:58 p.m. I would love the Mick and Keith cover...And you really hit the jackpot. I am trusting my parents to freshen up my record collection while I'm gone, rather than buy me stuff and send it. So, which Parliment album would you reccomend I request? I am a little funktarded, in a bad way. December 29, 2008 2:13 p.m.
First Yellowpoint and then Saltair... so Ladysmith basically. December 29, 2008 2:36 p.m. I am super happy for you that you got such a rad gift. And even more so that you no longer need cash. December 29, 2008 2:37 p.m. I think the thing I admire most about you right now is that you embrace everything - the Britney with the P-Funk. I think people could learn a lot from that. I am obsessed with Parliament. December 29, 2008 4:08 p.m.
December 29, 2008 4:41 p.m.
i am so glad you got that album. it seems like a precious gift. December 29, 2008 5:11 p.m. Sounds awesome! Thanks for that info too. I did have a friend who's girlfriend was sucidial. I did feel bad for him because usually, they just played video games together. But he was 16..yeah, and Kyle..I hope that never happens to anybody...but 15. December 29, 2008 6:19 p.m.
Hey Molly. Wow! It sounds like you had a great Christmas. You definitely got some really cool gifts for the holiday. I'm so psyched for you. I would be very thrilled if it was me. Congrats. Cheers! December 29, 2008 8:21 p.m.
December 30, 2008 4:15 a.m.
my fave line of the whole post - "i feel validated as a p-funk fan just for owning it..." i know exactly how you feel when you say that! live the life, molly! December 30, 2008 5:43 a.m.
glad to see you got a lot of stuff you wanted! December 30, 2008 9:26 a.m.
December 30, 2008 11:26 a.m.
you have such a intresting taste in music! December 30, 2008 11:57 a.m.
December 30, 2008 7:11 p.m.